Stumbled upon this site Collegedunia.com recently and found it very useful to every student in India who wants to get information on admission process, fee, eligibility, facilities in the college, college rating etc., before selecting a suitable college to apply for admission for graduation/ Post graduation in any specific stream. We see very scattered information in internet and there is no consolidated data about all colleges in India at a single place until the launch of this website. 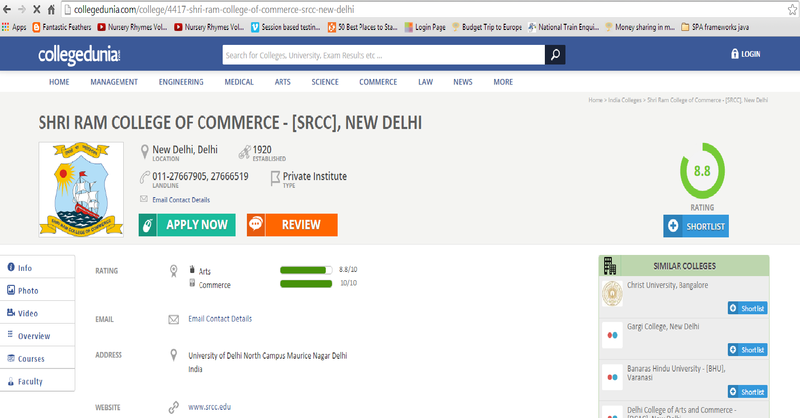 Collegedunia.com is an on-line portal owned by 3.14 Digital in New Delhi which lists 15000 colleges from different streams like Management, Engineering, medicine, commerce, arts, science and law. A simple search for a specific stream will list all colleges with information like different courses offered (full time/ part time/ distance/ on campus), contact details, address, website, photos, rating of the college, placement history and amenities. I was amazed to see the details about each college listed in the site! Students can get detailed information on each college and courses offered by them. Non-academic information like facilities in the college (labs, library, auditorium etc.,), placement history and alumni details are useful for students to choose right college. There is a separate section in website to cover latest admission notifications from different colleges. Exam results are also notified in this section. This website gives detail level information about each college listed. Huge database of content collected and shown in the website is very useful for students. It would be easy to compare different colleges with the rating that site provides. This website has a dedicated team to add high quality content periodically on cut offs, placements, admission, festivals and minute details like course intake fee and reservations. Though it basically caters to the needs of students, it is also beneficial for parents to compare colleges based on rating, fee and cut offs.